As the season draws closer and during the year, special days and tournaments will take place along the foreshore, and your invited to participate. 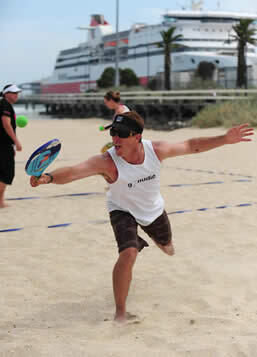 Beach Tennis is HOT, Are you? All of our Summers have been a huge Success with lots of fresh new talent! Young and Old! see photo gallery for highlights. Look under Australia Championships on the website. 38 Beaconsfield Parade, Port Melb. Come & Join in the fun! Serious Sport! Serious Fun! Casual Social Competition Doubles, rock-up and play, no commitment . Just be there at 6:15pm for a game, if your late No big deal, we'll get you started. 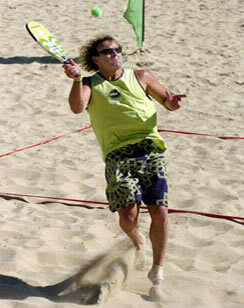 Be careful Beach tennis is highlyit addictive and good for your health. Cost is $20 casual, or 5 Pass $80, ($16 per session includes racquets. 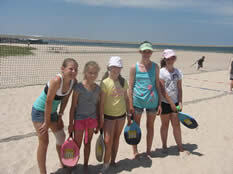 We sell beach tennis racquets too on the beach, prices start from $70. New to the game! Don't worry we'll teach you as well! The Ball's in your Court!! These are the things You'll See! Feel like you need an EDGE? Join a private training session and hone your skills, beyond belief. This Clinic will run for 4 consecutive weeks for 60 minutes. Cost is $100p.p for the 4 weeks, which includes hire of all equipment, coaching, games and a truckload of fun. Can register group with friends or on your own and we will find a group for you. Come and try as a group, school or as an individual we can tailor a session to your needs. It is all about having fun, getting active and trying something new. Email Paul today for more information or register your interest. When was the last time you tried something for the first time? Want a few coaching tips? call or email Paul today to organise . Time: Wednesday's 6:15pm-Dusk, Saturdays 10-12. ASK about a Season beach pass for next season, Great Value!!! Welcome to come at any time from 6pm and play as long as you like till dusk. Come as a family or a group of friends. The present general regulation is made by the IFBT to provide rules for competition. 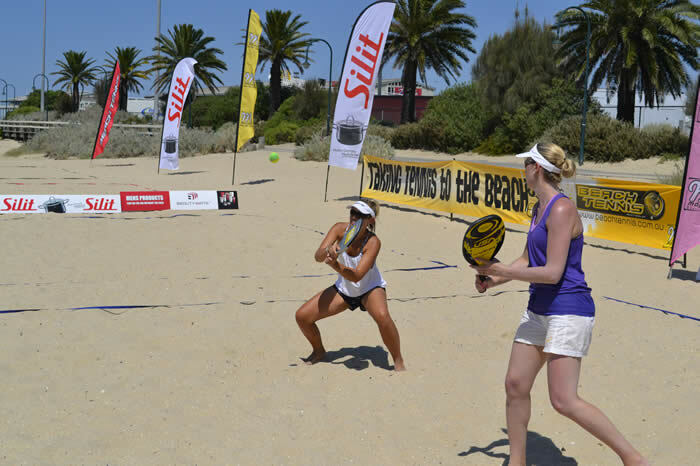 These rules are adopted here in Australia and adhered to at all Beach Tennis Australia events and programs. The playing area must be 16m lengths and 8m width, at right angles. 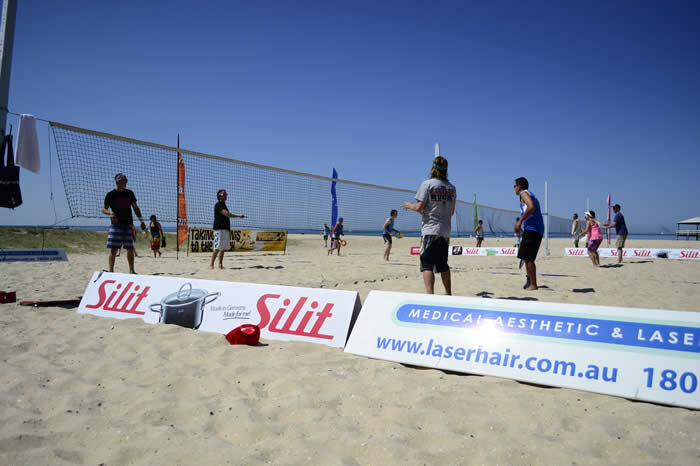 (Beach Volleyball) The playing area is divided into 2 parts by a net. The net at which stands at 1.70m at the middle. Singles court area is 4.5 metre by 8 metre per side. The line is a part of the court. Any part of the body touching the line whilst serving is a foot-fault. 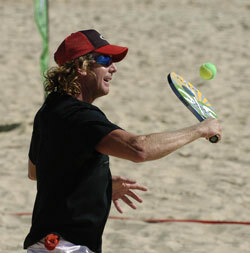 The ball is similar to the one used in court tennis, but of specialised low compression. Players must be opposite each other: the player who starts the point is deemed the server and the other, the returnee. When playing Mixed Doubles, male servers must serve under hand. The side or right of serve is determined prior to the game start. The player, who wins the toss, may serve, receive or nominate the opponent chose. 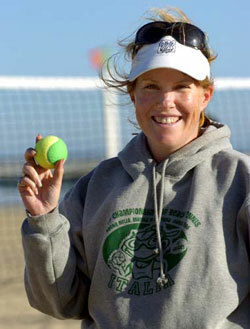 Each new server is allowed a practice serve, but must notify his or her opponent. Must be done outside the court area, and should the server infringe, loss of point is the result. Only one serve per attempt. This can be done overhand or underhand. A fault occurs if the server misses whilst attempting to hit or the ball hit a furnishing or fixture i.e. Net post. If the server invades the court prior to contact, a fault is also the result. The service is the same as lawn tennis, with a player serving out the duration of the game; the serve will alternate, following a pre-established order of serve. E.g. : especially in Doubles. Will occur when the score is at odd number of games or at the end of a set. Rule 10. How to determine points. A ball is sent outside the playing area after contact. If a player does something to distract the opposition players on purpose, whilst they are attempting a shot. (Gamesmanship)The reply is effective, should the ball hit the net and land in the opposite playing area. It is not possible to reply whilst invading the opponent’s court. The game is Aerial; the ball is always played on the volley! Game Score is the same as Lawn Tennis. No Advantage, sudden death at deuce! Can be varied, depending on program, but competition play will be a 7 up set, Tiebreak at 6 all. E.g. : 7/6 wins set. E.g. If you play up to 6, tiebreak at 5-5. Players change ends after 4 points in Tiebreak, TB played as per tennis to 7 points. Doubles can be played to 9 games, tiebreak at 8-8, as in World Championships. Only Authorised equipment can be used at competition or tournament play. Racquets must adhere to the regulation lengths and widths. 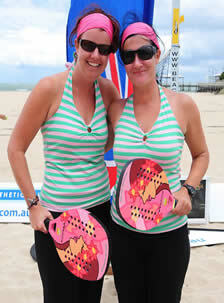 Beach Tennis Australia reserves the right to uphold the integrity of the game and the equipment within it.